« Did 16th Century German Women Wear Fur? One of the projects on my big wish list is to replicate Dorothea Meyer’s pleatwork and goldwork smock. Thus, it naturally follows that I need to learn how to smock. 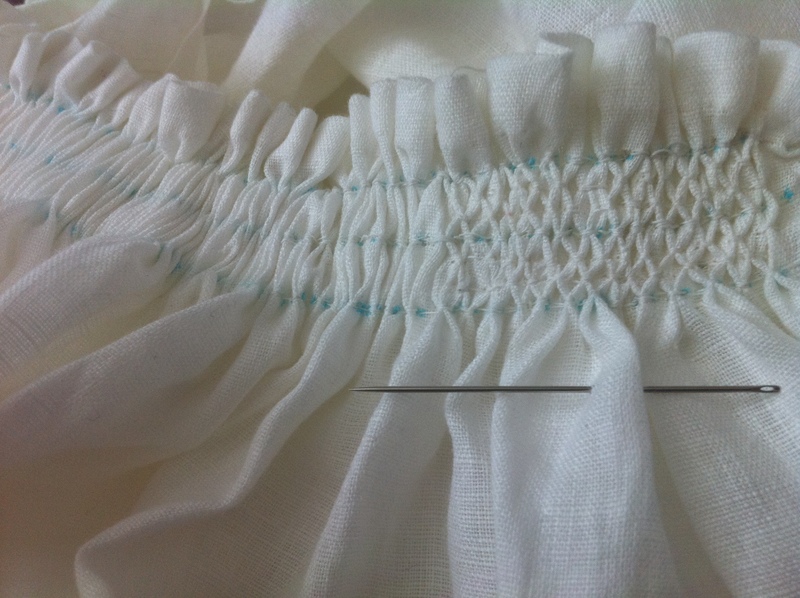 It turns out that “smocking” (the gathering and manipulation of pleats in a decorative manner) is a Victorian term, so I’m calling this silk pleatwork, which is the literal translation of the German word seidenfitzen found in Textiler Hausrat, Kleidung und Haustextilien in Nurnberg 1500-1650 (an English translation of this work can be found in the Files section of the GermanRenCostume group). An extant hemd (smock/chemise) from the 16th century found in a cloister in Alpirsbach shows pleatwork — honeycomb pleatwork, to be specific. Honeycomb pleatwork is also evident in a number of paintings and woodcuts, so I’ve chosen to learn the honeycomb stitches first. Being the ambitious sort that I am, my first pleatwork is a full hemd in linen. I cut out four rectangles, sewed them together where the collar will be, sewed a rolled hem at the top, and then created three rows of gathering stitches 1/2 inch apart. Now I am going back along those gathering stitches with the honeycomb stitch, creating six rows of honeycombs. I initially thought I’d just have the three rows of honeycombs, but it just didn’t look right, so I doubled it. The stitches are tiny, as are the honeycombs, and it seems they are tinier than other examples I’ve seen on the web. But they are not tinier than stitches I’ve seen in paintings, so I believe I’m on the right track. It certainly looks beautiful! Alas, it is slow going. I’ve only finished 1/4 of the neckline. 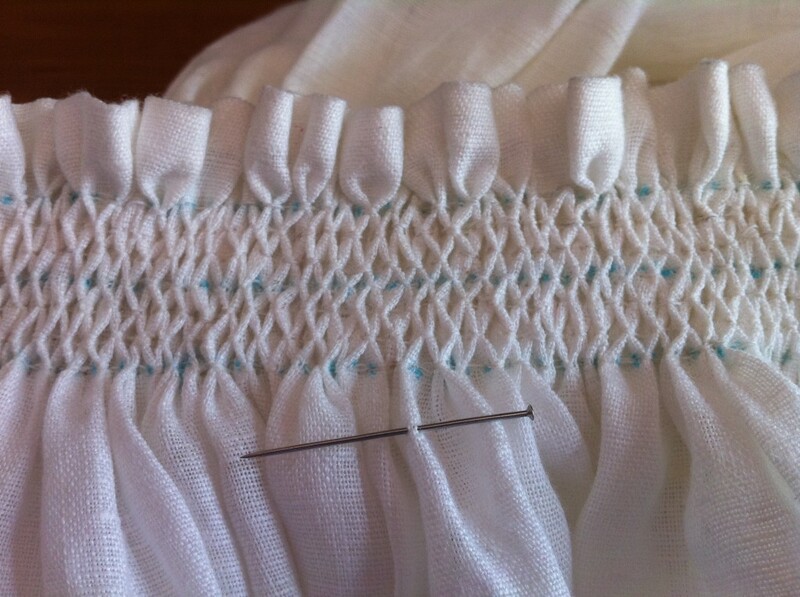 I am teaching myself to smock/shirr/pleat. My SCA style is German, like yours… or will be. I’ve been playing since 1985, and just coming back from about 8 yrs of not being able to play. I am trying to creat more accurate German dresses, etc. I appreciate the information you share. Question: did you cut rectangles in a length for a partlet or theentire hemd? How do I calculate pieces for hemd width accounting for the pleating? Do I just count collar x 2 because of 1/2 pleats? I am happy to hear you finished your apron. I sent you a Facebook friend request!